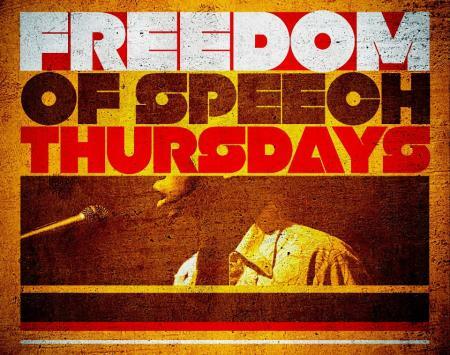 Freedom Of Speech Thursdays Artistic Collective @ “Sabor y Cultura” in Hollywood. Poets, lyricists, musicians, singers and creative folks are all welcomed to attend. The atmosphere is one of caring and love for all those sharing and in attendance. It takes tremendous courage for anyone getting on the mic. You will be encouraged, supported, and most of all loved. NOTE: If any of the venues rules are not adhered to and if there is any deliberate disrespect you will be asked to leave and not return. The owner, staff, and producers have this right. ALSO: 5 comedians MAX: comedians who sign up will have to put comedian after name. Also no comedians signing up back to back. Donation: 5$ donation for performers. If you do not have you will not be turned away, but it is recommended. This is an on-going event every Thursday. Time: 8p-11p. Donations are welcomed!!!!! All ages.